My husband and I went to the El Dorado Royale Resort on our honeymoon and we were more than pleased! Our first hand experience is that this resort is exactly what it says it is. This Caribbean resort is laid back luxury for adults. All inclusive vacation packages are available for this stunning resort. Upon arrival you are greeted with a glass of sparkling wine and Mexican tradition, and then off to explore the precious oasis of natural beauty in your resort. You will experience the traditional architecture scenery and fresh garden areas. El Dorado Royale is luxuriously romantic and stretches along a pristine secluded beach. Cozy beach lounges and beds line the shoreline. This Caribbean resort has a mile of beautiful, white sand on Punta Brava Beach and is spread among hundreds of palm trees. What sets El Dorado Royale apart from other resorts? 11 pools, a lazy pool river, Casita suites, roofless showers, jacuzzi in every room, beach beds, beach butlers, swing bars, swim up suites and 5 star Gourmet Inclusive Cuisine. This caribbean resort has two sections. 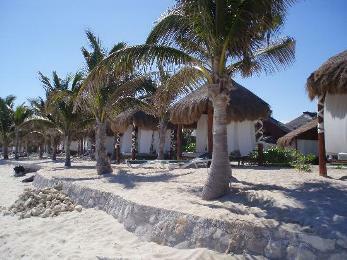 El Dorado Royale and the Casita Suites. They are the same resort, however depending on the price you want to pay and room amenities depends on which part of the resort you stay in. If you stay on the El Dorado side, your suite will include a jacuzzi, a/c, ceiling fan, safety deposit box, hair dryer, cable tv, terrace with hammock and two chairs, minibar with beer, water and soft drinks. Iron, Ironing board and coffee maker as well. 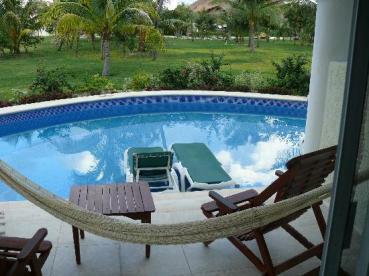 What makes Casita Suites different? The Casita Suites offer the same amenities and more, including a roofless shower, oversized balcony facing the Caribbean sea, high ceilings, palapa roof, oceanview jacuzzi, dvd, cd player, pillow menu, beach butler, aromatherapy, dvd library and lounge. 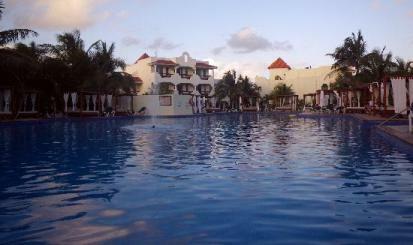 My husband and I stayed in a regular Junior Suite at El Dorado Royale and also a Casita Suite. 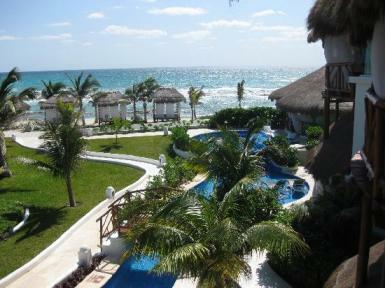 Both are wonderful, but if you have the extra money it is definitly worth staying on the Casita side of the resort. meals, snacks, alcoholic drinks, minibar, non motorized activities including paddle boats, kayak, snorkeling, scuba clinics in pool, hospitality desk, 2 tennis courts, rackets and balls. Taxes, gratuities, fitness center, sauna and steam room. Spa services at the intimate spa are not included in the All inclusive price. Relaxing and rejuvinating services that you can get are massages, facials, body treatments and beauty salon. Swim up Suites are unique to only a few All Inclusive Adult Vacations. This Caribbean resort offers lots of them! Swim up suites are steps away from the lazy pool river. This allows you to walk right out of your room into the swimming pool river. This is your view from inside your swim up suite. Italian, Pacific Rim Cuisine, International, Caribbean, Fondue, Culinary Theatre, 24 hour room service and a Health Bar. 13 Tropical Bars including swing bars (which have swings). This truly is a beautiful resort. It is very lush and green everywhere on this resort and beautiful flowers line your pathways! Where is El Dorado Royale located? The pool that was under a huge palapa near the swing bar has been covered with concrete and now used for outdoor entertainement and dancing. 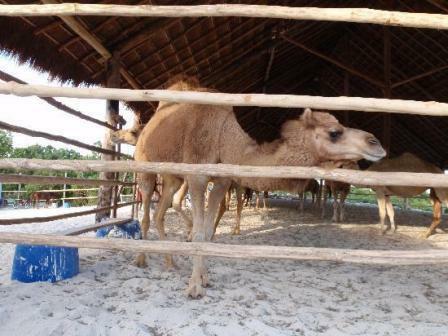 Camel and Horse rides are available onsite. They have a barn that house these as well as peacocks and goats. 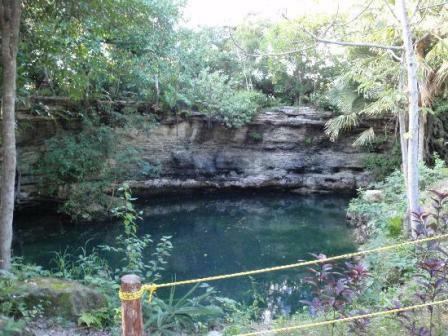 A new cenote is on the property of this resort now. The Jungle Bar is opening and is in a dried up cenote. The Casita Spa is now complete. It has a steam room, sauna, cold plunge shower, iced face towels, iced mineral facial spray, robes and slippers. Bottled water for guests. Hydrotherapy pool, hot tub, cold plunge pool, meditation garden with fountains. There are two bridal suites and a workout room. Massage area and sky hut. Unbelievable! The resort is trying to 'go green'. Solar panels are used to heat the pools. You are given a card at check in for a beach towel that you use each day. El Dorado Royale is also recycling. A new restaurant will soon open on the Casita side. It will be Italian. The sides and front are made of all glass. There is a breathtaking view of the ocean from here as well. 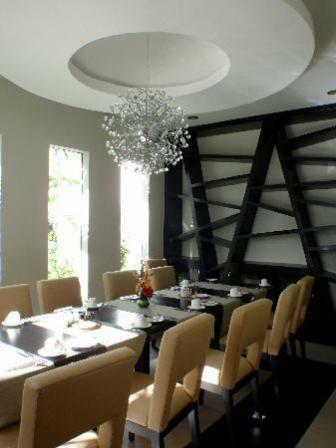 The decor is classy with dark tables and sand linen chairs.